Today is national Literacy Day. Dismal statistics have been announced where 45% of white working class children are leaving primary without being able read very well. The National Literacy Trust along with a coalition of charities, teachers, parents and businesses, have launched a campaign ‘Read on. Get On’. As part of Literacy Day, they are asking everyone to read a least 10 minutes a day to their children to help combat this crisis. I was listening to Eddie Nestor on BBC London drive time where he was asking listeners for ideas on encouraging children to read. I tweeted one of my successful ideas which was to leave a joke book on the breakfast table. My 6 year old daughter began to read us jokes every meal time. Reading and laughter was a recipe for success. She got over her self-consciousness about reading and just enjoyed it. The key is definitely finding a topic they love and can get involved with. At Story Boat, we’ll be using these beautiful story dolls to encourage storytelling and reading. 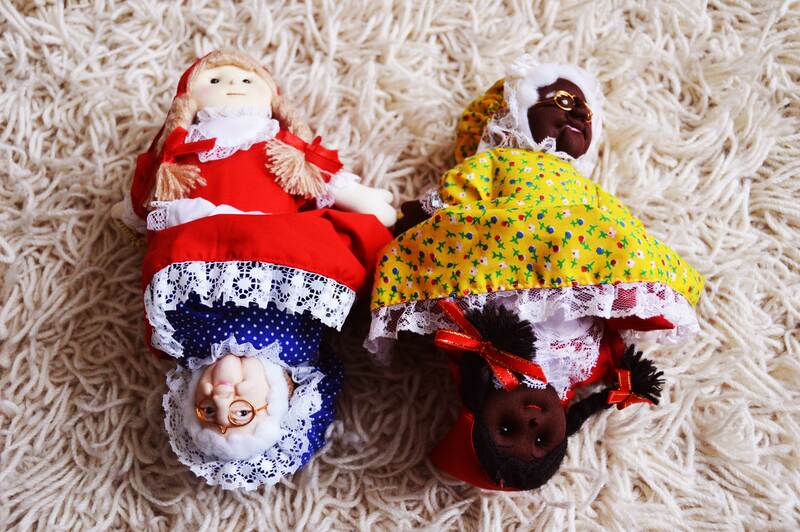 The dolls are characters from traditional fairy tales – Little Red Riding Hood and Goldilocks and the Three Bears. After retelling a story with young children, they can ask for the tale to be read to them at home or at school. The dolls were lent to me by my mother-in-law Lori Shearer who used to be a primary school teacher. Not only has she many storytelling tales to tell (some of which I’ll share in another post) but she has taught countless children to read.